Inexpensive Hotels in Budapest. Budget Best Hotels in Budapest. Inexpensive Hotels in Budapest brings you a unique selection of cheap (but good) hotels that are located in very convenient areas of Budapest downtown.These hotels I have chosen are 3 star hotels that offer great service and feature excellent facilities with very comfortable and good quality amenities. Inexpensive Hotels in Budapest tend to be small and focus mainly in accommodation, said that, don’t expect to find in the rooms expensive toiletries, designer linens or huge lobbies, fancy spa facilities, or enormous conference rooms. However, some of these hotels do have small gyms and on-site restaurants that offer varied alternatives. These hotels are located in central Pest, what means that there are plenty of good restaurants, cafés, great public transport and many Budapest attractions nearby. The best inexpensive hotels in Budapest I have listed below are all relatively new or renovated, so for sure you will find modern and trendy amenities. Gerloczy is a small gem in a very convenient neighborhood of Budapest. Near the Jewish quarter where there are lots of restaurants and cafés frequented mostly by locals. Vaci utca, the Fashion street, Central Market Hall, Raday utca, Elizabeth bridge and Deák tér metro junction are some minutes walk from the hotel. Gerloczy is a magnificent 19th century historical building that has a romantic, elegant and unique style everyone falls in love with. Its rooms are tastefully decorated , spacious with beautiful bathrooms and all the necessary facilities. This beautiful and inexpensive hotel in Budapest features delicious breakfasts, lunches and dinners you can enjoy at Gerloczy restaurant and Café on the ground floor of the hotel for an additional fee. The hotel staff excel for its helpfulness and kindness. They are all ready to help you out with anything you need. Hotel Central Basilica is a small but nice hotel located some meters away from the Budapest Basilica, close from Vaci utca, Opera House, Chain Bridge and Budapest’s Synagogue. The hotel rooms are middle size, tidy, clean and equipped with all the facilities of a good three star hotel. Superior rooms and apartments offer an amazing view of the Budapest Basilica, standard rooms offer the courtyard view. Breakfasts are generous with a wide variety to choose from. The hotel doesn’t feature a restaurant nor a bar but there are plenty of great cafés and restaurants in the neighborhood that you will be delighted exploring them. Staff are friendly and polite. Metro stations are less than five minutes walk, although from Hotel central Basilica you can reach most Budapest Attractions on foot. If location really matters to you this inexpensive hotel in Budapest is a great choice. Bo18 Hotel Superior is a recently opened cozy hotel located in a popular district of Budapest. It offers a friendly atmosphere with very diligent and kind staff. Rooms are all nicely equipped with a flat screen tv, a mini bar, free wi fi, air conditioning and telephone, (coffee and tea facilities upon request). Bathrooms are simple but immaculate since all facilities are brand new. Breakfasts are varied with a good selection of cheeses, meats, breads, cereals and fruits. The hotel features a small gym and several saunas (available for guests without extra charge), a small lobby and a bar opened 24 hours. Bo18 Hotel is a great value for money hotel, although it is not located in the middle of the city, Trams numbers 2 and 6, a metro station and the brand new Corvin Shopping Mall are 2 minutes walk away from the hotel. The immediate vicinity may appear run down to you, this is because the buildings still keep reminders of the hardships of WWII, but it is a very safe area indeed. 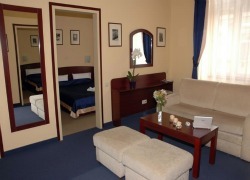 Bo 18 hotel is a modern and comfortable inexpensive Budapest hotel where you can find excellent rates. Star Inn Budapest Centrum is a quite new hotel located in a very convenient area of Pest. It is near Nyugati Metro station, Budapest City circle (Trams 2 and 4) West End shopping mall, Oktogon and the Budapest Opera House. Star Inn Budapest Centrum is a simple, modern, and affordable place to stay, its rooms are all modern, decorated with lively colors and equipped with flat screen tv, comfortable beds and a telephone. Wifi is only accessible in the hotel lobby but wired internet is available in the rooms (cable upon request). No tea or coffee facilities in the rooms. The rooms rates include decent breakfasts with good alternatives to start the day with. The hotel features a friendly lobby and bar opened 24 hours a day. Parking in the hotel is available for an extra fee. If location really matters to you, this is also a great inexpensive hotel in Budapest where you can get great value for money.